What strategy for internally rebalancing the euro zone? The euro zone has made significant efforts to reduce its trade imbalances since the outbreak of the financial crisis. In 2009, only Germany, the Netherlands and Austria had a current account surplus, while all the other countries, in particular France, Italy and Spain, ran current account deficits, resulting in a deficit for the zone as a whole (−0.7% of GDP). Five years later, in 2014, the situation had changed radically. The euro zone had a large current account surplus (3.4% of GDP) with almost all the countries running a surplus. It should nevertheless not be concluded that the euro zone has corrected its trade imbalances, as there are still several reasons for concern. Firstly, some of the current account surplus is cyclical, particularly in southern Europe, due to depressed domestic demand. Secondly, the magnitude of the euro zone’s current account surplus comes with deflationary risks: while for the moment the ECB’s expansionary monetary policy is helping to contain upward pressure on the euro, this pressure will eventually materialize once the monetary cycle enters a phase of normalization, leading to imported deflation and losses in competitiveness vis-à-vis the rest of the world. More importantly, the reversal of the euro zone’s current account position vis-à-vis the rest of the world does not mean that the zone’s internal imbalances have been corrected. The analysis that we made in the 2016 iAGS report shows that there are still significant imbalances, although they have diminished since the start of the crisis. 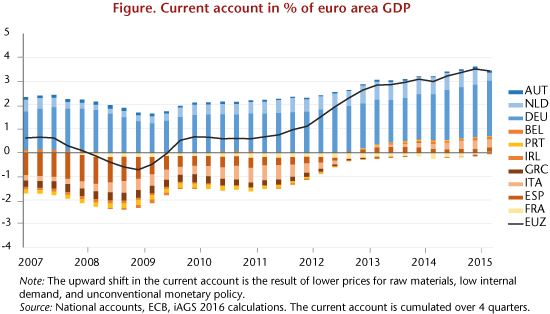 Based on a model to simulate changes in the current accounts of the euro zone countries in terms of price competitiveness differentials , we calculated the nominal adjustments within the euro zone needed to achieve balanced current accounts for all the countries. A balanced position is defined here as stabilization of the net external position, at a level compatible with EU procedures (i.e. greater than −35% of GDP), and with the output gaps closed in all the countries. The table below shows the results of these simulations and helps to take stock of the adjustments made since the beginning of the crisis as well as the adjustments still needed relative to Germany, which is used as a reference point. here were still significant nominal misalignments in the euro zone in 2014. Several groupings of countries can be identified. Austria and the Netherlands are on level footing with Germany. In contrast, Greece must undergo a nearly 40% depreciation compared to Germany, despite its previous sacrifices; even if the Greek current account is close to balanced today, this is due to the output gap that has widened considerably (−12.6% in 2014 according to the OECD) and artificially improved the external trade balance by shrinking domestic demand. Between these two extremes lies a group of countries, including France, Spain, Portugal, Belgium and Finland, which need a depreciation of about 20% relative to Germany. Italy meanwhile is in a somewhat better position, with a relative depreciation of about 10% required, thanks to its current account surplus (1.9% of GDP in 2014) and a relatively favourable net international investment position (−27.9% of GDP). These nominal imbalances cannot be solved by changes in exchange rates, since the countries all share the same currency. The adjustment thus has to be made through relative price movements, i.e. by differentials in inflation rates between countries. Thus, inflation in Germany (and the Netherlands and Austria) needs to stay higher for a while than in the intermediate group, which itself needs to be higher than in Greece. And, given the importance of wages in determining the price of value added, this outcome will be achieved mainly by differential changes in nominal unit labour costs. There are several possible ways to achieve this goal. The one that has been followed so far has been to make the reduction of labour costs the norm, based on a non-cooperative race for competitiveness. With Germany making extensive efforts to hold down its prices and wages, other countries could adjust only by cutting their own costs, whether through wage cuts (as in Greece and Spain) or by lowering corporate tax (as in France). While these strategies have indeed helped to reduce imbalances in the zone since 2008, as our table shows, the adjustment is still far from complete, and the economic cost has been high. Lowering wages in the southern European countries undermined demand, and therefore business, while deflationary pressures were strengthened and are still threatening, despite the ECB’s energetic policies. Another approach would be to coordinate wage developments in the euro zone countries in order to allow the ECB to meet its inflation target of 2%, while making nominal readjustments. Each country would set a target for changes in its unit labour costs. Countries that are currently undervalued (Germany, Netherlands, Austria) would set a target of over 2%, while overvalued countries would set a target that was positive, but below 2%. Once the imbalances were absorbed, which would require a number of years, the targets could be harmonized to 2%. The relative adjustment of unit labour costs could also be made through differential gains in productivity. This point highlights the importance of investment stimulus policies in the euro zone, so as to improve the productivity and competitiveness of countries that need to make significant nominal adjustments. Using this approach to adjust unit labour costs would release some of the downward pressure on wages and domestic demand in the euro zone. A policy like this would represent a profound change in the economic governance of the euro zone, and would call for enhanced cooperation. This is, however, the price for maintaining the cohesion of the monetary union.